If approached with the right attitude (both by the host and the student), staying in homestay accommodation can be a fantastic way to improve your English, learn about British culture, and possibly make new friends. We try very hard to make sure that all of our homestay accommodation is clean, comfortable, and friendly. We inspect all accommodation and interview the hosts before we accept them for our students. Britain is a multi-cultural and multi-ethnic community, and our people have tastes that reflect our long history of immigration. As well as traditional ‘British’ food, you are likely to be offered Italian, Indian, Chinese, and many other different styles of cuisine. And we don’t usually stop everything at 5 o’clock for a cup of tea. The population of Britain is made up of people of all races, ethnicities and religions, so you may be living with people who don’t look like what you might imagine British people to be. Some homestay providers are not of English origin but all speak English to high standard. It is also possible that your homestay ‘family’ is not similar to typical families in your country: it may be made up of two parents with a number of children, or it may just be one person living alone, or anything in between. We try to match students with homestays and to find the right homestay for everyone. It is important to book early and to tell us about your requirements e.g. in the areas of diet, smoking, children and pets. If you are in self-catering homestay you will not have so much opportunity to practise your English as you will not be sitting down for a meal with your host(s). 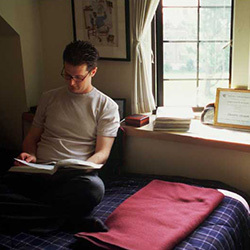 Students are sometimes required to house share with students of their own language in the summer. If we place you in the accommodation that already hosts a student of the same nationality we will inform you in advance. You are welcome to cancel your booking if you are not happy with this option. However this happens very rarely and only if there is no alternative accommodation available. Single room.Shared room (only available to 2 students booking together). The host family will keep the house and room clean but you should keep your room tidy. Please remember that you are in someone else’s house and that it is not a hotel. The family will treat you like a part of the family and will help you with any questions you might have. If you have a problem with the host family, first tell the host family politely, it might be a misunderstanding. If this doesn’t help, tell us. Half board: breakfast and evening meal included daily (cooking facilities not included, access to these is at the host’s discretion).Breakfast only: cooking facilities not included, access to these is at the host’s discretion. Board type most suitable for students that like to eat out in the evening.Self-catering (single room only): no meals provided, full use of kitchen facilities provided by the homestay.Breakfast is not usually cooked. It is often toast and marmalade, cereal, fruit juice and tea of coffee. Dinner is the main meal of the day and should include meat, fish or poultry, unless you have asked in your application form for vegetarian meals. Special dietary requirements available on request. Please inform the school at the time of the booking. The family will do laundry at least once a week, but if you have a lot, you should go to a launderette. If you have something that needs to be cleaned in a special way, it is best to go to a dry cleaner’s (there is one near the school). You will have to do your own ironing but the family will lend you the iron and the board. Everyone in the family needs to use the bathroom and there is often only one bathroom in the home, you will need to ask your host when is the best time to have your bath or shower. Towels are provided by your family. You can only use the telephone with your host family’s permission. Please ask your family if it is ok to make calls with a phone card. Please remember that the phone belongs to the family, and do not stay on the phone for too long. Internet access might be available in some homestays. Please ask the host upon arrival. Please note: in our school premises you can enjoy free Internet and wireless connection Monday to Friday from 08:30 to 17:00. Please note that majority of our homestays have a pet. Please let us know in advance if you are allergic. Your family will give you a key for the house. You must take very good care of it and you cannot give it to someone else or copy it. If you lose it, tell the family immediately. You might have to pay for a new one.